A two days workshop on leadership skills was conducted at Anandadham for the students of classes X, XI and XII. 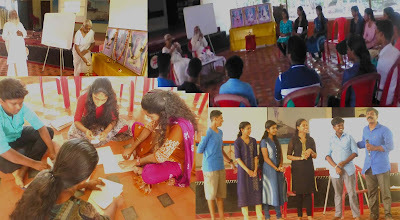 15 students ( 6 from Edavilangu, 5 from Aripalam-Vellangallur and the rest from Kodungallur) attended the camp.The workshop was inaugurated by Mananeeya Lakshmi Didi.The sessions were from 9.30 am to 4 pm. On the first day,Sri Sudhakarji conducted the sessions.Several groupwise activities were given to the students so that they themselves could recognise and be aware of their own skills they possessed and those they were lacking.while performing the activities.The basic qualities required to become a leader were also discussed. A few video clippings based on excellence through everyday practice, perseverance an essential quality of a leader and having a vision of the goal set by each of them helps in achieving success. On the second day, Sri Ramesh master an NSS trainer conducted the morning session. He made the students realize, through various games and activities, how a short term goal and along with it, a long term goal is a must, to be a leader. In the concluding session, students expressed their gratitude for having given the opportunity to be a part of the camp.